Take ½ fresh coconut, cut into small pieces, add ½ cup water. Blend it in the mixture. Strain the milk into the sieve. Use this milk for kneading the dough. 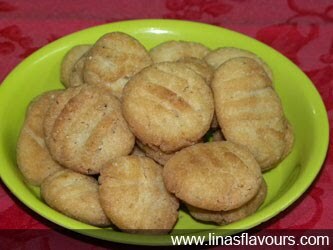 Take maida, rava, sugar, baking powder and mix it well. Add butter, curd and mix it well. Knead the dough with coconut milk. Use the milk as required. Make a soft dough like roti dough. Leave it for 15-20 minutes. Make small rolls of about 1 inch long. Take two forks and slightly press on both the sides. It will create the design. Prepare all the biscuits like this. Let is dry till all are done.